Tour catacombs of Rome, St. John and Holy Stairs – Leaving from Piazza San Bernardo, crossing Piazza della Repubblica, we will reach and visit the Basilica of St. John in Lateran (interior visit), cathedral of Rome and of the world, famous for its baroque and medieval masterpieces kept intact inside. 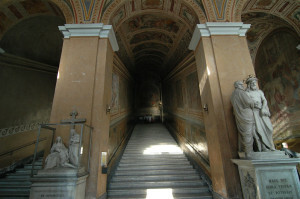 Hence, we will go to the Holy Stairs, consisting of twenty-eight white marble steps, now encased by wooden steps. According to tradition, the staircases were part of the praetorium of Pilate in Jerusalem, hence were sanctified by the footsteps of Jesus Christ during his Passion. Leaving the Basilica and skirting along the Mura Latine, the tour will pass through the Porta di San Sebastiano to arrive on the Ancient Appian Way, where we will find the Chapel of “Domine Quo Vadis” there St.Peter supposedly met Jesus while the former was fleeing persecution in Rome. We’ll reach the Catacombs and after the visit we will continue walking along the Ancient Appian Way up to the Mausoleum of Cecilia Metella, built around 50 B.D. On the way back, from the coach you will enjoy the view of the Caracalla Baths: they were Roman public baths, or thermae, built in Rome between 212 and 216 AD, during the reign of the Emperor Caracalla.